When I first became a Christian, I looked for the presence of God in my life. See, I was initially a non-believer, so I asked God for a sign. I’m sure He got a good laugh out of that one. The presence of our Lord was all around me, I just had to open my eyes to see. Yet in Luke 1:39-47, we learn that an unborn child recognized God’s presence in Mary’s womb. “Call me and call my image Santa Maria de Guadalupe”. 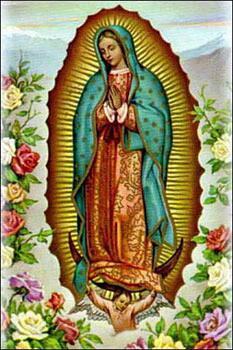 It’s believed that the word Guadalupe was actually a Spanish mis-translation of the local Aztec dialect. The word that Mary probably used was Coatlallope which means “one who treads on snakes”. Within six years of this apparition, six million Aztecs had converted to Catholicism. The tilma shows Mary as the God-bearer – she is pregnant with her Divine Son. Since the time the tilma was first impressed with a picture of the Mother of God, it has been subject to a variety of environmental hazards including smoke from fires and candles, water from floods and torrential downpours and, in 1921, a bomb which was planted by anti-clerical forces on an altar under it. There was also a cast-iron cross next to the tilma and when the bomb exploded, the cross was twisted out of shape, the marble altar rail was heavily damaged and the tilma was…untouched! Indeed, no one was injured in the Church despite the damage that occurred to a large part of the altar structure. Mary’s appearance to Juan Diego as one of his people is a powerful reminder that Mary and the God who sent her accept all peoples. In the context of the sometimes rude and cruel treatment of the Indians by the Spaniards, the apparition was a rebuke to the Spaniards and an event of vast significance for Native Americans. While a number of them had converted before this incident, they now came in droves. According to a contemporary chronicler, nine million Indians became Catholic in a very short time. In these days when we hear so much about God’s preferential option for the poor, Our Lady of Guadalupe cries out to us that God’s love for and identification with the poor is an age-old truth that stems from the Gospel itself. Thank you so much, Dolliewilkinson@gmail.com, for this great post! Most complete story I have read of Saint Mary of Guadalupe.